The orchid genome was jointly launched by the five research institutions, including BGI, on July 20, 2009. The plan is to construct an orchid genome map and perform transcriptome sequencing studies on 10 orchid species. Orchid is one of the most diverse and highly evolved plants in the world. Orchidaceae (commonly known as orchid) is the most important and most influential endangered species in the world. Paphiopedilum, one of the orchid species, is listed as a first-class key protection with giant pandas and is known as the “Panda of the Botanical World”. The Orchid Genome Project was officially launched on July 20, 2009 by the "Orchid Genome Project Consortium" consisting of Shenzhen BGI Life Science Research Institute (formerly “Shenzhen BGI Gene Research Institute”), Shenzhen Orchidaceae Plant Protection Research Center, Tsinghua University Shenzhen Research Institute, Institute of Botany of the Chinese Academy of Sciences and Taiwan Success University. 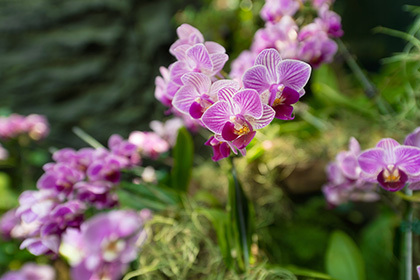 The program will perform genome-wide sequencing and bioinformatics analysis of Xiaolanyu Phalaenopsis, and the transcriptome sequencing on gene expressions in 10 representative orchids such as Apricot, Magnolia, and Cymbidium. The program will provide insights on orchid ecology, differences in phenotypic characteristics of orchids, extraordinary environmental abilities, and the genetic basis and molecular mechanisms of various evolutionary and metabolic patterns.